Mini Dental Implants can improve the quality your life! A Simple Procedure with Immediate Results! 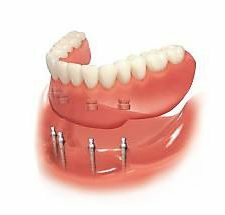 The mini dental implant procedure is a much less involved process than the conventional dental implants. For this reason, the procedure can usually be completed in one simple dental appointment. In addition to saving time in the dental office, you will have far less discomfort following this procedure due to the minimally involved dental procedure (usually requiring no surgical flaps or sutures). Because the mini dental implants are so time efficient, your dentist is able to perform these procedures at a fraction of the cost associated with the larger old style dental implants.